5. Display your shopping haulTrawling foreign lands for treasures is half the fun of exploring somewhere new, but having a theme in mind can focus your search. These texture-rich baskets combine to create a knockout display. Tie in some of the colours with cushions, and you have a look that works. 1. Cluster colourful basketsWhy hang one or two baskets when you can hang a whole bunch of them? Collect decorative woven baskets in various sizes and colours and play around with possible arrangements on the floor before hanging them. Can’t find colourful baskets? Create your own by painting the interior of plain ones with craft paint. Be a basket caseThere was a time (the early nineties, perhaps) when it was the done thing to receive gifts in baskets, and you politely kept them aside for the day they might become useful again. 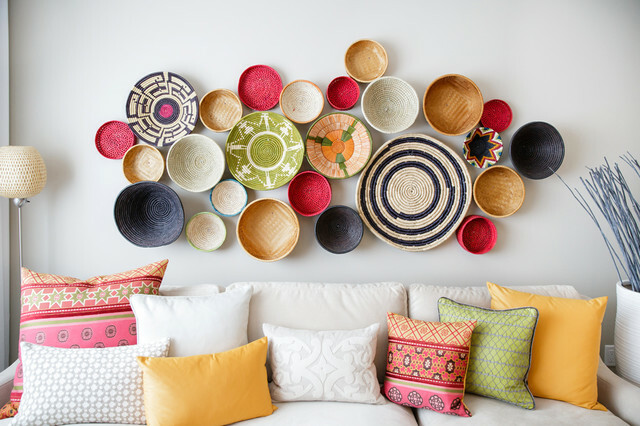 Instead of piling your basket collection in a corner of your garage, turn it on its head (or at least on its side) and create an unusual feature wall using your family of baskets. The repetition of the circular pattern will hold them together in spite of different styles and sizes, with each basket’s weave and pattern telling a story of its own. You could add a splash of paint to them, too, and tie the colours into your existing decor. Change up your wallsTry something new on your walls in your living room and create a new focal point. If you’ve always stuck to traditional rectangular shaped frames, why not try circular shapes or pieces with textural or hand-woven details.This is a great way for all the bowerbirds out there to show off their unusual wares! Get them out of the cupboard and up on the wall. STYLE TIP: Remember little things look great when shown off in a collection, or a series, so do the same when styling your walls and vertical spaces. This is what I mean by high impact from a large number of objects! So you went a little crazy shopping for mementoes on your latest holiday, and now you’re stuck with a bunch of hand-woven baskets and bowls?Natalie Fuglestveit Interior Design has a solution to turn that frown upside down. Here, an asymmetric wall display gives this living room that extra oomph, creating a travel bug vibe.